April Showers Bring A Bossier Calendar! March 31, 2018 Sara Hebert Bossier Pride and History Comments Off on April Showers Bring A Bossier Calendar! Welcome April 2018! Need a way to track the days and celebrate the best stuff in Bossier? We’ve created a monthly calendar featuring artwork by Bossier architect, Mike McSwain. Alongside his team at his architectural firm, Mike has created some of Bossier’s most iconic buildings in recent history: CSRA Integrated Technology Center, the Cyber Innovation Center and the East Bank District Plaza. He can also be found toting around a handy sketchbook and creating beautiful drawings of buildings throughout the area. Each month, we’ll feature one of Mike’s sketches on our calendars, available for your computer desktop in addition to a printable for hanging next to your desk. 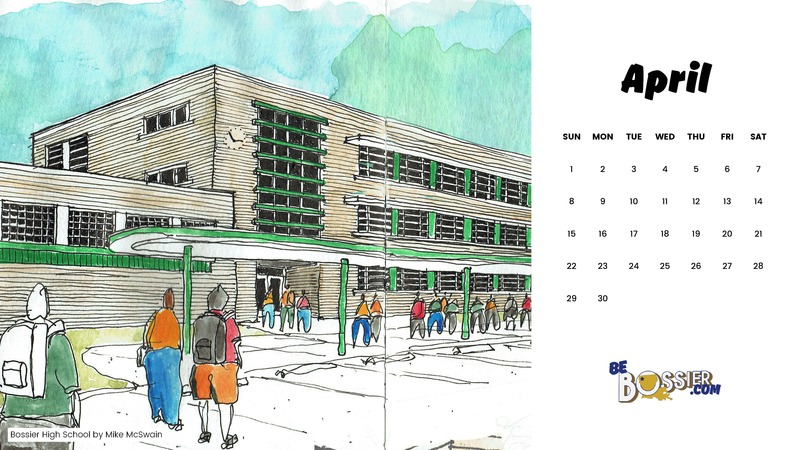 This month, Mike’s sketch of Bossier High School graces the calendar. Next Post:Do You Know the History of Haughton?